Steve Becker, Aquatics Director of the Westside J.C.C. from 1983 to 1997, was coach and organizer of under-16 Los Angeles area and National Team swimmers for seven Maccabi Youth Games events. Between 1990 and 1996, his youngsters won more than 300 medals in national and international events! No other coach in any other event approached his success. Becker also coached the Westside Wave, the highly successful Center swim team that competed in regional and national events. 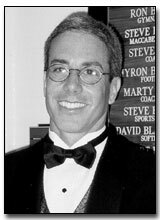 Many of Becker’s swim-kids went on to successful collegiate careers, including Lenny Krayzelberg, University of Southern California’s late ‘90s swimming phenom. Becker welcomed the pre-teen Krayzelberg, newly arrived from Odessa, Russia, to the Westside Wave in 1986. With the right start from Steve and key guidance from others, young Krayzelberg has developed into the top backstroke swimmer in the world.